San Francisco is one of the most iconic cities in the world. With its endless list of famous landmarks, natural beauty, ideal climate plus a great and vibrant culture that is rivaled only by other cosmopolitan cities such as Paris, Milan, Mexico City, and Shanghai. San Francisco is on every traveler’s list of places to visit as evidenced by the more than 17 million tourists that visited in 2017, a 3% increase year over year. Although only about twice as big as Manhattan, San Francisco’s density packs in over 800,000 people, sectioned off by neighborhoods that are cleverly named such as The Tenderloin, Russian Hill, The Presidio, The Mission, North Beach, and of course the famous Haight & Ashbury. San Francisco is also home to the very first and largest Chinatown in the country with over 15,000 residents living in about 20 square blocks just north of North Beach. The vast array of cultures has always been a staple of the city’s reputation of being ultra liberal, progressive and very welcoming of immigrants. San Francisco has been rapidly changing both culturally and architecturally as more and more families are being priced out while the tech communities move in. The skyline is now dominated by the new Salesforce Tower which is over 61 stories high, dwarfing the iconic 58-story Transamerica Pyramid building that dominated for over 44 years. Minorities who for generations staked claim in neighborhoods such as The Mission are being priced out to more affordable areas situated across the Bay such as Oakland. It is little wonder why there is a huge influx of migration arriving to this beautiful area that offers clean air, easily walkable streets, and has been a pioneer in the “green” movement, encouraging a healthy lifestyle. The majority of San Francisco residents love the city for many reasons such as the vast cultures that coexist, the beautiful parks, the beaches, and of course the iconic Golden Gate Bridge. Considered by all major polls, the Golden Gate is the most beautiful bridge in the country and the first thing that comes to mind whenever anyone mentions “San Francisco.” The famous landmark alone attracts over 10 million visitors a year and has appeared in countless films such as Planet of the Apes, Godzilla, and the Incredible Hulk, in which the bridge always gets destroyed one way or another. 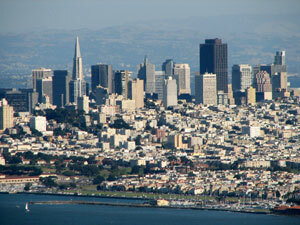 San Francisco is not only a great place to visit but also to live and work. The many different neighborhoods offer something for everyone and the many parks, museums and monthly festivals that seem to sprout out of everywhere are also a main attraction to all who live in the Bay Area. As Tony Bennett’s famous song says, “I left my heart in San Francisco.” Yes, San Francisco is indeed a very special place.